1. What are the new enhancements of AmOnline? 2. What are the system requirements for using All New AmOnline platform? The AmOnline app can still be installed in older Mobile OS versions but there may be noticeable lags while using the app. 3. What will happen if I use a system not specified above to access AmOnline? You will unable to access All New AmOnline platform. Outdated systems also are less stable, and much more vulnerable to viruses, malware, and other security issues. In addition, the outdated systems’ display capabilities are very limited. AmOnline will neither look nor function as how it was designed to in outdated systems. We highly recommend you to use the internet browsers and mobile app versions specified above to access AmOnline in order to have an optimized user experience. 4. Where can I access AmOnline? You can access from anywhere in the world via Internet. All you need is a computer terminal or personal electronic device with internet connection and Internet Browser. 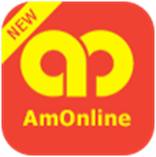 You also can access AmOnline through our mobile application for Android and iOS devices. You only need to download it from Google Play Store for Android and Apple Store for iOS devices. Below is the app icon in Google Play and App Store. 5. Can I change the AmOnline language? Yes, AmOnline is available in multiple languages. You can choose from English, Bahasa Malaysia and Chinese. You can select different language by clicking on the “v” icon. Then, choose your preferred language from the dropdown list. Note: English is set as a default language. 6. Why some words are still in English even after I choose Bahasa Malaysia or Chinese? Product Names, Technical Glitch Message. Legal Related Matters, Terms and Condition. SMS (TAC & Alerts), Emails, Receipt, Promotional Materials. 7. Can I send Secured Message using Chinese character? No, our Secured Message feature does support Chinese character. 8. Can I enter any Chinese character in AmOnline? No, AmOnline does not support any data entered in Chinese character.